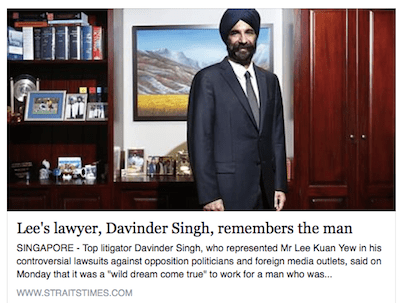 Top litigator Davinder Singh, who represented Mr Lee Kuan Yew in his controversial lawsuits against opposition politicians and foreign media outlets, said on Monday that it was a “wild dream come true” to work for a man who was his parents’ hero, according to a report in the Straits Times. “When I was growing up, I would hear my parents describe Mr Lee Kuan Yew as the greatest man alive who gave his people, especially the minorities, the ability to live with dignity and in safety,” he wrote. The report states Mr Singh won court victories on Mr Lee’s behalf against opponents like opposition politicians Tang Liang Hong, Chee Soon Juan and foreign media outlets like The Economist, Bloomberg and the New York Times. “I sat with and talked to this genius who, more than anyone, understood human nature and societies, who had the third eye and could see trends and dangers which we mere mortals were blind or oblivious to, and who knew with complete confidence what was best for his people and Singapore,” it quotes him. Known as “Davi” by his close associates, Davinder was one of the first dozen Senior Counsels appointed in Singapore, equivalent to the Queen’s Counsel in the United Kingdom. He was also a Member of Parliament for Toa Payoh Group Representation Constituency (GRC) from 1988 to 2006. When Mr Singh was a cadet in the Singapore Armed Forces Training Institute in the 1970s, there was once a parents’ visit where Mr Lee was guest-of-honour. “My father immediately stood up when it was announced that Mr Lee had arrived, even though he must have known that, standing so far away in the midst of hundreds of parents and cadets, Mr Lee would not have been able to see him. After he stood up, others from all races followed. It was then that I truly realised what this Chinese man meant to my Punjabi father who was not even born in Singapore. Mr Lee died on Monday morning, aged 91. Mr Singh won court victories on Mr Lee’s behalf against opponents like opposition politicians Tang Liang Hong, Chee Soon Juan and foreign media outlets like The Economist, Bloomberg and the New York Times.